Santiaguito (Guatemala): (31 Dec) During our stay at / near Santa Maria volcano during 26-29 Dec, we observed only explosive activity at Santiaguito, but no signs of effusive activity (lava flows): no rockfalls or other movements were seen at the recently active lava flows or on the flanks of the dome itself, indicating that at present, no lava flows are active. 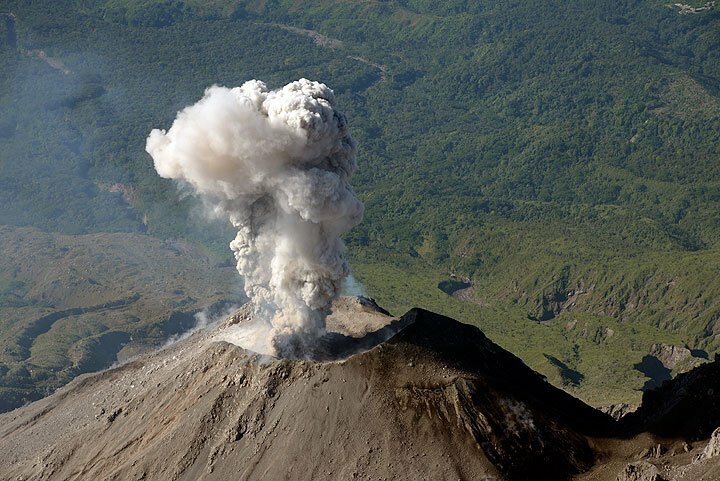 The volcano's activity consisted in explosions of varying size, at irregular intervals ranging between 10 minutes and 8 hours and producing ash plumes that rose up to 2-3 km above the Caliente dome. Sometimes, only loud, jet-engine like degassing events took place instead of ash explosions. These degassing events often lasted more than 10 minutes, while the explosions typically only took less than one minute. Photos and impressions from our (still ongoing) tour will be posted in the New Year. Fuego (Guatemala): (31 Dec) The activity at Fuego might be picking up towards a new paroxysm (eruptive phase with strongly increased effusion rate, resulting in lava fountaining and lava flows). We camped on the SW side of the volcano last night, and observed mild to strong strombolian explosions that occurred at intervals between 1 and 10 minutes. The strongest explosions sent incandescent material to heights of up to approx. 500 m and similar distances. One particularly intense explosion was accompanied by a very strong shock wave.